1. Dust Jackets - Do I keep them on? Use them as a bookmark? Take them of while reading and them put them back on? Take them off forever so they'll be in pristine condition for collection? Frame them and hang them up on a wall to create appealing and edgy wall art? Decoupage? I just don't even know anymore. 2. Feeling like my life is so very boring - Yes, yes. There are times when I finish a book and just lay on my couch in abject misery because my life just doesn't seem quite as interesting as the lives of characters I read about. Why can't I have a walking castle? A floating city? A white rabbit running around my heels yelling about time?! Why are there no alternate universes? No Time travel? Magic powers? I WANT TO WEAR A PRETTY DRESS! Yeah. I get pretty down until I remember I have coffee on. That usually perks me right up. I am potentially too easy to please. 3. Movies based off Books (MBOB) - I usually always love the book more (except in the case of Twilight), though there have been some ones that I really enjoyed. Many of them, however, have been ABSOLUTE CRAP! So now I have anxiety over MBOBs. Should I go see it? Will I be mad for the next month after watching? Do I mind potentially wasting $11.50 on a ticket? Can someone PLEASE tell me why no one can EVER cast the characters correctly? I mean COME ON! 4. Comfort - There is an optimal comfort position while reading. I just have no idea what it is. 5. FLOW - Okay, let me explain this quickly. Flow is that awesome, and real, psychological thing that actually happens to you when you read a book you're really into. The "getting lost in a good book" thing? That's called "Flow" and it's addicting. So...very...addicting. I want to experience Flow with every book but it seems like, out of all the books I read in a year, only a handful of them really really get me there. It's a constant quest. For all of you academic types out there who want to know more about this, read: Flow: The Psychology of Optimal Experience by Mihaly Csikszentmihalyi (that is a real name). 6. Not Enough Time - The average adult is believed to read something around 5 books a year (No Joke), but what about those of us who try to squeeze in 100 reads per annum? Even if we live to be 100 years old, and even if we started reading at exactly 5 years old, we would only read 9,500 books in our lifetime. THAT IS NOT ENOUGH. I have seen people on goodreads with near that many on their "Too Read" shelf and that doesn't even include books that haven't been published yet! Really makes you rethink that TBR situation, doesn't it. 7. Book Covers - Oh, my constant love-hate relationship with covers. I prefer covers that don't picture faces of people because it throws a wrench in my imagination and I have trouble creating my own image for the characters, which means I don't connect as well with the them. Not to mention... if your protagonist is "dark skinned, with caramel hair" then why, oh why, is your cover picture of a PALE WHITE GIRL WITH RED HAIR AND FRECKLES? EXPLAIN YOURSELVES! No, really. I need a 2,000 word expository essay about how this is even remotely okay on my desk by noon. That gives you 3 hours, sunshine. I'll be waiting. But really, I can hardly even stand walking into a bookstore these days because I can't justify my purchases with all of the TBR nonsense I have going on back at the house. I also kind of have to eat. That's why I love that Amazon Prime now covers some USED BOOK purchases. $1.5 for a book with free shipping? Yeeehaw, baby! 9. Shelf Space - I live in a very very very tiny state. With very very very tiny apartments. As many of you, the number of books I have points casually to my insanity. My Booksanity. My Inbooksanity? Well, they call it Bibliomania. So there you go. Cinderblocks and woodplanks make for very fun shelving. 10. Bookmarks - I don't use them. I own them, but just because they're pretty. I'll buy a new one and think to myself "Now that I have this pretty bookmark, I'll actually stop dogearing my pages!". Not so. Yes. I dogear. No, I do not dogear books that aren't mine (library or otherwise borrowed), so calm down, Betsy. 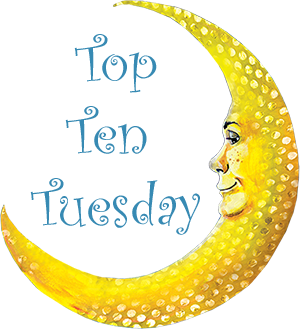 What are your Top 10 bookish problems? I'd love to know! I have many of your problems. Shelf space- what is that LOL. I am a cover addict I do judge a book by its cover against better judgment. Face covers do annoy me though! Haha I felt like you were explaining my life with this post! The whole dilemma with the covers being whitewashed irks me more than I can describe! I hear you on the dust jackets! I hate reading with them on a book because 1) I don't want it to get torn but mostly because 2) I feel like they make it hard to hold onto a book.